Espaço Tintin – Tintin: Destination Lisbon! This is the place I have always hoped would open in Lisbon, and it did last year, by the end of November. The only Tintin store I have visited till now has always been in Brussels, and although the Lisbon store is not as big as the Brussels one, you can find in here almost everything the trademark Tintin sells, such as postales, pins, agendas, notebooks and PVC figures. They also sell clothing for all seasons, books, watches and miniatures of the famous car from Hergé stories… There is even a room filled with Tintin’s book covers, which belong to the owner and Tintin fan, Paulo Ferreira de Almeida. 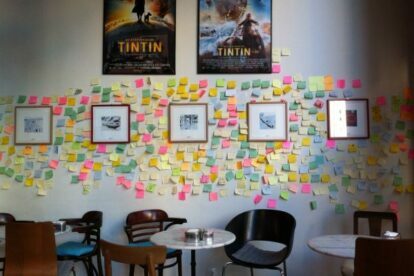 At the same place, you have a very nice and cozy Cafe-Lounge with also recalls Hergé character’s heroism, as it has some very nice original lithographs of Tintin books as wall decoration. What attracted me most, besides being a cafe with Tintin’s allusion, is the way the tables are organized, making each space of the cafe very different and private. The menu holds no surprises, except for the Belgian beers, of course. I suggest their muffin – unbelievably good! The only problem the cafe still faces is a lack of organization. Sometimes the delay in the service is just unacceptable, but I like the place so much that I really never cared about that. They also serve lunch, as a “meal of the day” basis and salads and are opened till really late. And, best of all, on Mondays.